IMAGINE! You and Your Loved Ones STAYING HERE! Oceanview Rooms and Suites, Fireplaces, Hot Tubs, In-room coffee. refrigerators, cable color TV's & free WiFi, Continental Breakfast. 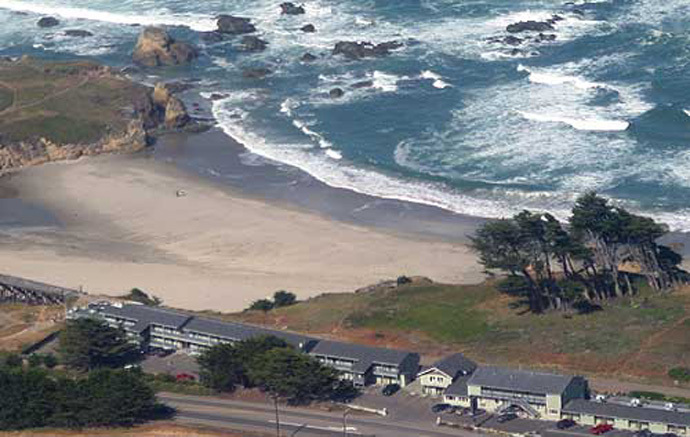 Located at the north end of Fort Bragg just past the Pudding Creek trestle and on the beachside of Highway 1 is the Beachcomber Motel. The name is no exaggeration. Broad aprons of sandy beaches are a stone's throw from the redwood deck outside your sliding glass doors. Views of the windblown meadows and cypress trees with the deep blue sea stretching to infinity bring hours of relaxation and contemplation. Seventy-two rooms and suites with king, queen and double beds, private baths, cable TV�s and some with kitchenettes await. Two of the upstairs luxury suites have indoor hot tubs for honeymooners or anyone wanting to relax in the swirling hot waters while the ocean and elements orchestrate a symphony outside the floor to ceiling windows. Seasonal rates are from $99 to $259/2 per night Ask about special midweek and off season rates. The picture windows of your room let in spectacular sunsets. Wintertime storm and whale watching is at its best from the 2nd floor suites with their nine foot sliding glass doors. While gale force winds and the elements are orchestrating a magnificent show outside, you can be bubbling away in your private hot tub with a cheery fire crackling in the fireplace. Children love the peaceful adventure of racing the bluffs and trails and then returning to their safe and cozy room. Bicyclists and hikers can explore the 3 1/2 mile paved haul road to the north as it dips and climbs over the headlands parallel to the crashing surf and wintertime cascading creeks. A few of the rooms are reserved for travelers with pets, but please remember that busy Highway 1 is out-front and state park rangers patrolling the headlands ticket dogs off-leash. Fishermen and abalone divers will appreciate the large redwood decks where they can clean the days catch and BBQ. An enormous tide pool lies elevated in a bowl at the end of a trail due west of the Beachcomber. Occasionally the fog is as thick as London�s and the waves are as big as Hawaii's Pipeline. On clear nights the sky reveals a galaxy of stars above the Beachcomber. refrigerators, cable color TV's & free WiFi.